Prophetess; wife of Shallum, the keeper of the wardrobe in the time of King Josiah. She dwelt in the second quarter of Jerusalem. It seems that Huldah enjoyed great consideration as a prophetess, for when Hilkiah found the scroll of the Law he, with his four companions, took it to her. On that occasion she prophesied that God would bring evil upon Jerusalem and upon its inhabitants. The king, however, was told that he would die in peace before the evil days came (II Kings xxii. 14-20; II Chron. xxxiv. 22-28). Huldah and Deborah were the only professed prophetesses, although other pious women had occasional prophetic revelations. Both had unattractive names, "Huldah" signifying "weasel," and "Deborah" signifying "bee" or "wasp." Huldah said to the messengers of King Josiah, "Tell the man that sent you to me," etc. (II Kings xxii. 15), indicating by her unceremonious language that for her Josiah was like any other man. The king addressed her, and not Jeremiah, because he thought that women are more easily stirred to pity than men, and that therefore the prophetess would be more likely than Jeremiah to intercede with God in his behalf (Meg. 14a, b; comp. Seder 'Olam R. xxi.). Huldah was a relative of Jeremiah, both being descendants of Rahab by her marriage with Joshua (Sifre, Num. 78; Meg. 14a, b). While Jeremiah admonished and preached repentance to the men, she did the same to the women (Pesiḳ. R. 26 [ed. Friedmann, p. 129]). 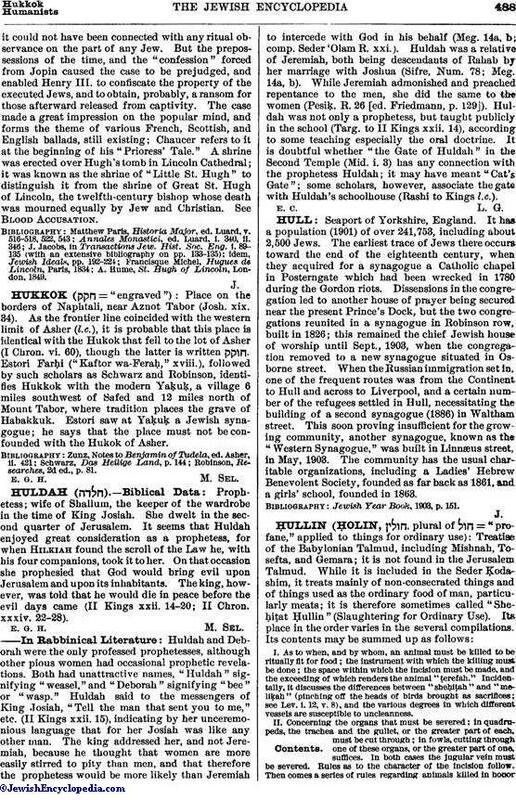 Huldah was not only a prophetess, but taught publicly in the school (Targ. to II Kings xxii. 14), according to some teaching especially the oral doctrine. It is doubtful whether "the Gate of Huldah" in the Second Temple (Mid. i. 3) has any connection with the prophetess Huldah; it may have meant "Cat's Gate"; some scholars, however, associate the gate with Huldah's schoolhouse (Rashi to Kings l.c. ).